Although this blog’s primary aim is to cover entrepreneurship, innovation and business information you may have noticed my other interests popping up from time to time. However, I didn’t want to burden you with my sad loss of my beloved motorbike last Autumn. She didn’t crash or self-destruct (a common 2-stroke phenomenon) but when a coil failed it was the end of the road until I could get a replacement. Given her age and rarity it took me until last week to find a suitable part on eBay and actually win the bidding. Today she came back to life and is now back in my life and I couldn’t resist sharing the good news here. 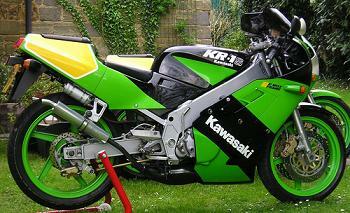 For those very few of you who are actually interested ‘she’ is a Kawasaki KR-1S 250cc two-stroke twin from 1991. “Another bend: and I have the honour of one of England’ straightest and fastest roads. The burble of my exhaust unwound like a long cord behind me. Soon my speed snapped it, and I heard only the cry of the wind which my battering head split and fended aside. The cry rose with my speed to a shriek: while the air’s coldness streamed like two jets of iced water into my dissolving eyes. I screwed them to slits, and focused my sight two hundred yards ahead of me on the empty mosaic of the tar’s gravelled undulations. This entry was posted in Uncategorized, work/life on 13 March 2008 by ninfield.